Brisbane, Qld (1 April, 2016) – Genie, a market leader in Australia’s Elevating Work Platforms (EWP) industry, is setting a new benchmark for customer service with its groundbreaking Genie 360 Support initiative. “Genie 360 Support is the single biggest initiative undertaken by the Genie team in the past decade. It will shake up the entire EWP industry and cement the position of Genie for several decades to come,” said Mitch Ely, National Operations Manager, Terex AWP. “Driven by industry change and shaped by customer feedback, Genie 360 Support ensures we have a laser-like focus on customer needs. As a complete end-to-end customer Support solution, Genie 360 Support will revolutionise the EWP industry,” adds Ely. Fleet replacement – Genie 360 Support offers a valuable exit strategy through generous trade-in programs. Genie has established an extensive system of channels to move aged fleet, including export, authorised brokers and retail sales through its established sales network. Major Inspection and Fleet Refurbishment – Genie has invested heavily in state-of-the-art heavy maintenance facilities to carry out major inspections and heavy maintenance repairs. Genie is also revolutionising the major inspection program by introducing a recently developed process utilizing data collected from all over the world to provide the most efficient inspections currently performed in the industry, which will deliver significant savings to the customer, improved ROI and reduced downtime. Genie 360 Support offers Verification of Competency (VOC) machine specific training programs for all Genie equipment via our training arm – LiftPro. It is the first manufacturer endorsed and manufacturer operated training program unique in the Australian market. “We believe this program is world class and will become the benchmark for all future machine specific training programs,” say Ely. 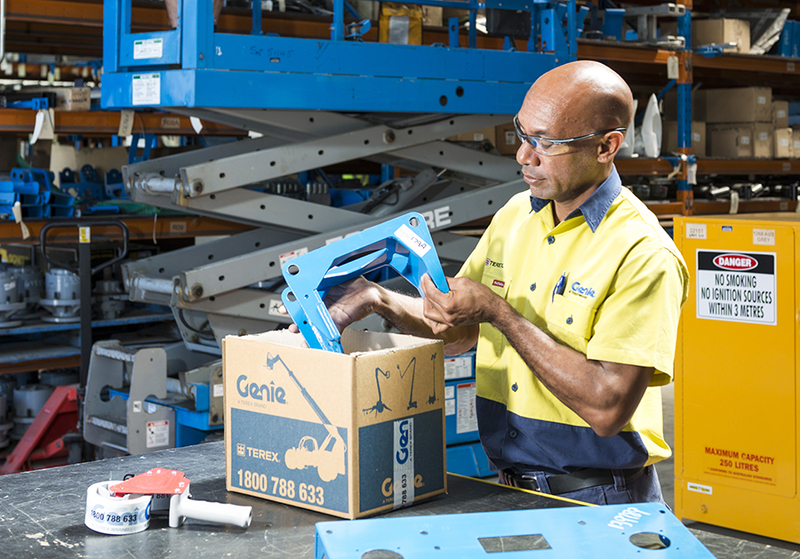 National Parts Centre – Customer support has been consolidated into a single National Parts Centre giving Genie customers a 12-hour a day parts support service with accelerated response and supply times, reduced freight costs and delivery of genuine Genie parts to any location across Australia. Web portal offers 24/7 access to parts – Genie has tapped into the company’s strong online presence to provide the flexibility and convenience of 24/7 online parts ordering. With the introduction of our heavy maintenance facilities, Genie has added dedicated resources to major inspections, freeing up our field service technicians, providing increased support to our customers. Genie 360 Support incorporates TechPro – a suite of three training solutions delivering 24/7 technical support to keep Genie machines productive right around the clock. Online technical training - The Genie online technician training is free and can be a convenient solution for busy technicians operating within the hire industry. Face to face technical training – Customised training packages are available across Australia. “Genie 360 Support is all about giving the customer more without additional expense. We anticipate this will be a ground-breaker for the EWP industry in Australia – and will continue to underline the Genie reputation for developing smart end to end solutions, customer experience and aftersales support,” said Ely.